Waverly Gallery (Paperback) | The Drama Book Shop, Inc.
Kenneth Lonergan is known for his trademark humor and genius for capturing the real heart and soul of human interactions. Time magazine raved that he is "among our most gifted, unflinching and unpretentious new playwrights," and called his first play, This Is Our Youth, one of the ten best plays of 1998. With The Waverly Gallery, Lonergan has once again shown himself to have "one of the keenest ears of any working playwright" (Ben Brantley, The New York Times). 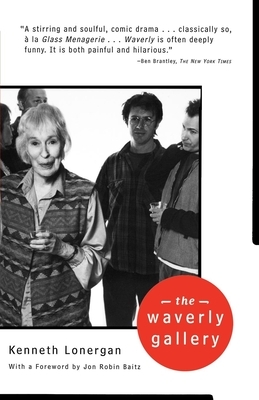 A powerfully poignant and often hilarious play, The Waverly Gallery is about the final years of a generous, chatty, and feisty grandmother's final battle against Alzheimer's disease. Gladys is an old school lefty and social activist and longtime owner of a small art gallery in Greenwich Village. The play explores her fight to retain her independence and the subsequent effect of her decline on her family, especially her grandson. More than a memory play, The Waverly Gallery captures the humor and strength of a family in the face of crisis. "You will be awed by Lonergan's writing." -- Christopher Isherwood, Variety; " Lonergan] has written a loving but brutal, commercial yet unflinching American family drama that knows about the simultaneous human systems of entertainment and agony. As anyone who cares about aging loved ones already knows, life on that particular edge is often so real you have to laugh. . . he is dead-on about family in all its simultaneous affection and irritation." -- Linda Winer, Newsday; "A stirring and soulful, comic drama ... classically so, a la Glass Menagerie ... Waverly is often deeply funny. It is both painful and hilarious." -- Ben Brantley, The New York Times.